Born around 1925 in the little village of East Durham, in the Catskill Mountains of New York state, Blossom Margrethe Dearie discovered music at the earliest age, as she would always find someone’s laps to sit on at the family piano, and was very soon able to pick out songs from ear and memory. At age five, she started taking lessons, and kept on studying classical music until her teens, when she switched to jazz. Dearie started playing professionally in the late 1940’s, when she moved to New York City and performed with vocal groups such as Alvino Rey's Blue Reys, and Woody Herman's Blue Flames. In 1950, she began her solo career, by pairing piano with voice, and playing in a little club in Greenwich Village. That is where she met Eddie Barclay, who convinced her to come to Paris. Blossom then recorded her first solo album on the Barclay label. She also formed the Blue Stars of France, with whom she gained a Billboard hit with the "Lullaby of Birdland", arranged by Michel Legrand in french. After returning to the U.S., she recorded six albums for Verve Records. In the 1960s, Blossom recorded an album for Capitol Records entitled "May I Come In", accompanied by an orchestra. She also recorded four albums for Fontana in England. During thoses years, Dearie played a lot in clubs, like the Village Vanguard, where she shared the bill with Miles Davis. In the 1970s, she started performing more in concerts rather than clubs, and even played at Carnegie Hall in 1973. In 1974, Blossom Dearie became the first woman to own a independent record label in the United States : Daffodil Records. 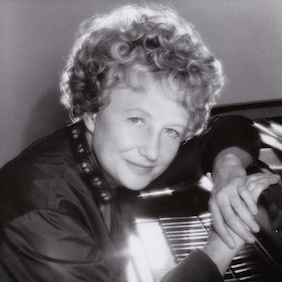 The first album released was “Blossom Dearie Sings” featuring music written entirely by herself. Until her last performance in early 2007, Blossom recorded over a dozen albums and played frequently in clubs in New York and London. She passed away in February of 2009. She was a remarkable jazz pianist, vocalist, and composer.